i bought two of the new orly matte couture polishes on sheer whim. because truth be told, i don't really like matte polish. they dry to darn fast and i like to take my time and be gentle and loving with my brush strokes. that's why i have my trusty essie matte about you topcoat, darn it! so i wouldn't be suckered into buying these matte polishes! but hey what can you do, when the polish-frenzy urge strikes, it strikes. these orlys really weren't that bad, as you will see below, if applied thickly and quickly *le sigh* they look pretty dope. the finish isn't chalky matte like the opi collection, but rather sort of vinyl and soft looking rather than stark. the blue of this is also unique to my collection, but the finish didn't do it for me so much. it looks dusty, hence the "suede" name but i didn't really like it. so what do you do with a matte you don't love?? put seche on it! which i did--then promptly messed up all to hell. so no pics sorry i was fed up as it is taking pics of my right hand. please forgive. ALSO, the finish on these is SOOOOOO fleeting! i think i've mentioned that i run my tips over my lips to check if they're dry or not and just that made my ring fingernail shiny and no matter how long i waited it didn't go back or dry or whatever made it change looks. the purple kept getting prints or smudgy looking marks on the top too, although it wasn't dents in the polish, it was just on the finish. like smudges on your windshield. NO BUENO! 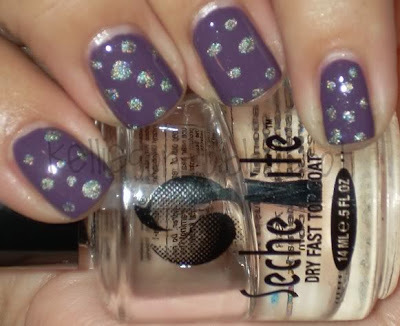 so i decided to fix this crap up and put polka dots with my china glaze kaleidoscope visit me in prism on the purple velvet and use seche on top to salvage the wreck. it was fun, but i would definitely file this mani under a big fat FAIL. *humph* well they can't all be winners! a big smooch to all you polished ladies!